Oh, Mountain Dew Baja Blast and Double-Decker Tacos, wherefore art thou? The “tropical lime storm” that is the Baja Blast had not been tropical lime storming it up on the Grand Canyon University campus alongside the Double-Decker Taco. After a year of rumors that turned into a confirmed rumor that turned into months of anticipation, Taco Bell made its debut Monday morning for employee training, complete with Baja Blasts and free tacos and burritos. 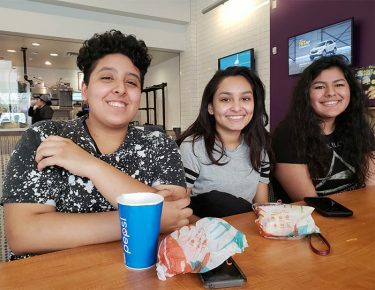 The opening couldn’t have come soon enough, if you ask students, and the eatery opened its registers for purchases late Tuesday with a line of Lopes almost out the door ready to place their orders. The opening comes a week after another new campus dining option, Pita Jungle, got humming with its Mediterranean-inspired menu. Members of “Camp Barth” were there to witness it all – and be first in line to score some much desired Taco Bell nosh. The eight Camp Barthians dubbed themselves after government student and GCU Ultimate team co-captain Adam Barth. 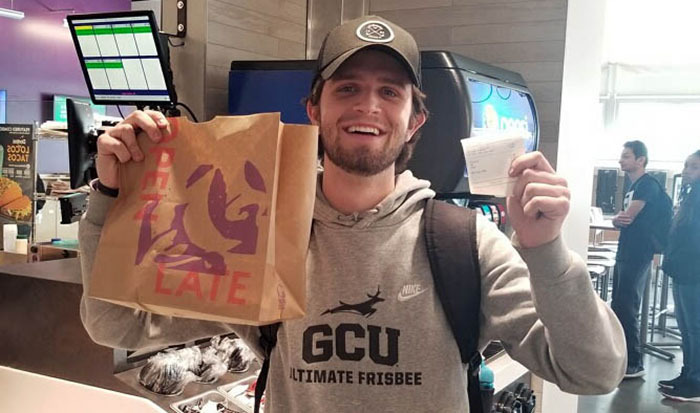 He was the first to suggest that he and his fellow Ultimate buddies — the sport is more popularly known as Ultimate Frisbee — should camp out for the Taco Bell opening. The guys assured their lead spots in line by pitching up a tent and hanging a hammock Sunday night. “We heard rumors, and (President) Brian Mueller said it would be on Monday. A couple of us said, ‘We’re just going to camp out until it opens,’” sophomore mechanical engineering major Jesse Wilch said. 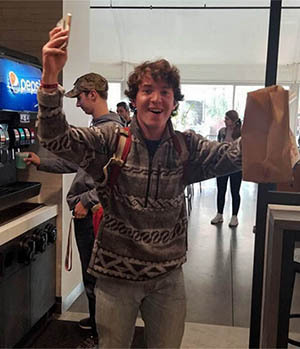 He was the second in line to land some Taco Bell grub (the infamous Double-Decker Taco) just behind Ultimate teammate Jake Dibley, the first in line, both to resounding applause. The eatery is the latest in the campus dining boom that has featured not just Pita Jungle and Taco Bell but a new GCBC, Fresh Fusion and Chick-fil-A on the ground floor of Diamondback Apartments, in the fast-growing area of campus on the other side of Lopes Way. 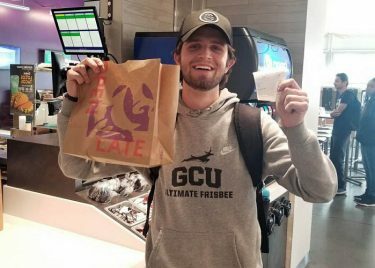 Taco Bell takes over the main space in Thunder Alley and adds its name to GCU Dining’s roster of more than 20 locations and five convenience stores. John Milleson, Food Services General Manager, said the buzz he’s heard from students is that they’re excited about this Taco Bell location because it is not an “Express” version, usually a smaller campus version of the real thing that offers a limited number of menu items. “We’re a full Taco Bell,” he said. With its open kitchen, Taco Bell is trying out a new design style and new concept for university campuses with its GCU location. The full menu means happiness for sophomore social work major and psychology minor Abby Encinas, who stopped by to “Live Más!” Monday afternoon for the employee training and free tacos and burritos. “I’m excited for it,” Encinas said, expressing particular delight over the dollar menu. 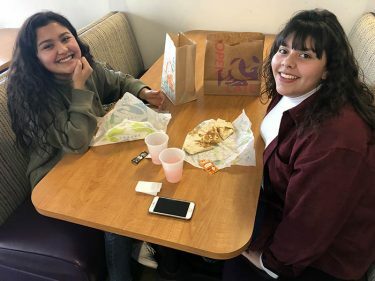 Alejandra Arnaud and Rebeca Zermeno, freshmen from San Diego, waited 20 minutes Monday to get their Taco Bell fix. “I think we’re going to be here often,” they said. Refer to GCU Dining’s Twitter or mobile app for Taco Bell’s hours of operation. Reach GCU senior writer Lana Sweeten-Shults at lana.sweeten-shults@gcu.edu or at 602-639-7901. Fellow GCU senior writer Theresa Smith contributed to this story.